iamVinhdicated: The race that stops a nation. No, I wasn't in Melbourne today. I wasn't even at the races in Sydney today. I didn't even celebrate in a fancy restaurant or bar. In fact, I didn't even WATCH the race. I didn't even know who won until my sister told me tonight. I was stuck at work during the running of the Melbourne Cup, but that didn't mean I didn't get into the spirit. I got a little bit fancy at work today, pretty frock and high wedges and girly accessories and all. I even thought about doing the whole fascinator thing, but thought it may just be a bit much for my local shopping centre lol. 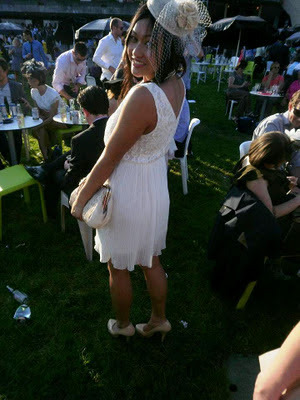 I did actually make it out to Randwick a few weeks ago but I never got around to blogging it. So here it is as well. 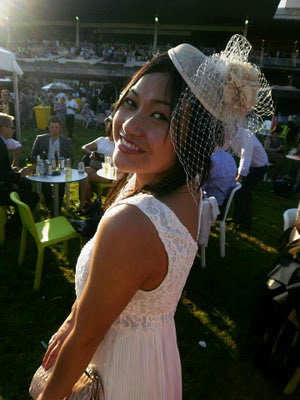 I love heading to the races - I love getting all glammed up, rocking the hats and fascinators, and checking out what all the other girls are wearing. And this year, I had a new found appreciation for what the boys were wearing too (yes, that's what my life's come to - I actually get excited when new suits/shirts/trousers come in at work, sigh). I love the excitement in the air, I love the rush of watching the horses gallop by, and why yes, don't mind if I do indulge in a bet and a glass of bubbly or four. I had an amazing day with some amazing girls, and the weather turned from cloudy and overcast to brilliant, bright & blue. Love love love love LOVE! Instead of my regular bolds and brights and florals and prints, I decided to opt for a dainty, ladylike vintage look, that cost way less than (I hope) it looks - I actually even made that fascinator myself! I can't wait to go again - I love a good excuse to play dress ups!